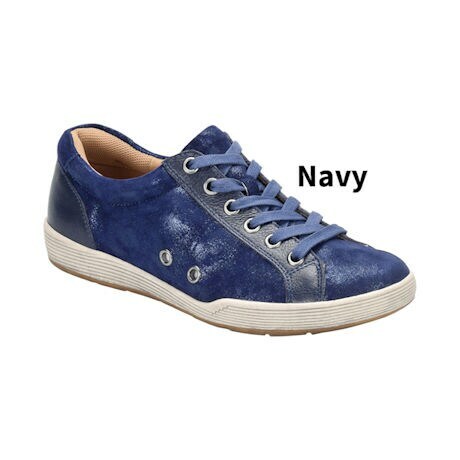 Soft Spots® Comfortiva Lyons lace-up sneakers have a classic design that's dressed up with unique distressed foil suede uppers. The classy sneakers not only look great, they're loaded with comfortable features to help keep you on your feet longer. Pillowtop™ cushioning comforts with every step, with special attention to the arch and ball-of-foot. The memory foam footbed contours to your foot, distributes weight evenly, helps maintain proper alignment for less muscle fatigue, and reduces stress on pressure points. Memory foam heel counter helps prevent irritation from rubbing. The removable footbed accommodates custom orthotics. Imported Item can only be shipped within the Continental US.